Porrima’s mission is simple. To help you convert more business, while helping you retain the existing customers that you have worked so hard to win. 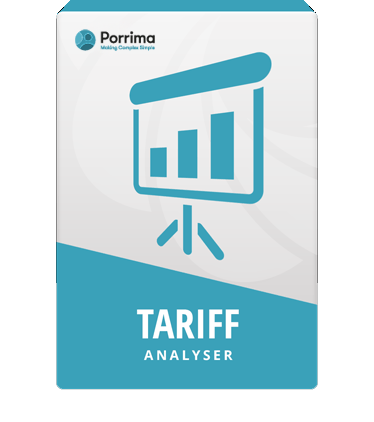 With Porrima’s Tariff Analyser, you can perform independent, cost effective, comprehensive and accurate analysis on your customers’ current mobile and fixed line bills. With a full and accurate breakdown of your customers’ bills, you can more easily demonstrate cost savings, and ensure your proposals reflect their actual needs and usage. Our rates depend on a number of factors, including whether the analysis is for mobile or fixed line, the number of CTNs, the itemised usage format, and the number of months required. Please download our standard price list. Do you offer discounts on volume? Yes, we do. Our customers come in all shapes and sizes and we can put together a plan that’s viable and cost effective for you, dependant on the volume of analysis required. Do you share information with the networks and distributors? No, we don’t. We are an independent company and do not share your information with any third party. We are, of course, happy to sign any NDAs as required. Why do we need to perform analysis for our existing base? More and more partners in the telecoms industry provide their key customers with monthly analysis reports. In this very competitive industry, regular analysis is paramount in keeping your customers happy. It demonstrates that you are ensuring your customers are on the right plan with the correct bolt-ons, so that they are never paying more than they should be. If your customers are exceeding their allowances or receiving higher than usual bills, it’s vital that you are able to identify and demonstrate in a clear and easy to understand way where the charges are coming from and who is responsible for them. What if I need an urgent same day/following day report - could you help? We understand the urgent pressures of trying to win customers and so are happy to help out with any last minute analysis requests. Usually we are flexible and can help, but it all depends on the size of the account and the billing formats that you provide us. CSV or access to online billing can be the quickest; PDFs and paper bills take us longer. Do your reports let us know which mobile numbers require certain bolt-ons? Yes, they do. Our reports specify how many bolt-ons are needed and which individual mobile numbers require them. This will save your salesperson a lot of time when allocating bolt-ons. Can we rename Tariff Analyser so it is our own product? Yes, you can. You can name your tariff analysis solution whatever you like and have the reports fully branded in line with your company’s identity. Could we charge our existing customers for these reports? Yes. Some of our customers offer their customers monthly or quarterly reports for free as a value added service but some may charge. It is completely up to you. What if we wanted additional information to be displayed as part of our report - is this possible? Yes, we are always adding different information to our reports on the back of customer requests. The great thing about Tariff Analyser is that there are no limits as to what we can do. You are even able to pick and choose which pages make up your final report. This is useful when particular information is not relevant to certain customers of yours. We find Tariff Analyser an essential part of our business for both retaining our customer base & winning new. Porrima products are free to try, easy to set up, and work seamlessly together. Are you ready to win new business and maintain your existing customer base?